Casting: Nagarjuna, Karthi, Tamanna, Shriya, Anushka, Jayasudha, Prakash Raj, Ali, Tanikella Bharani, Gabriella Demetriades, Late Kalpana, Nora Fatehi and all. 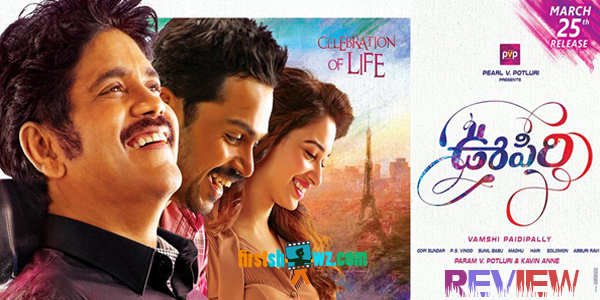 this week starring Nagarjuna, Karthi, Tamanna in lead roles. The film is released all over and gains positive buzz from the premiere show. The film is directed by Vamsi Paidipally and produced by Param V. Potluri and Kavin Anne under PVP Cinemas banner. The movie also features with Prakash Raj, Ali, Tanikella Bharani, Gabriella Demetriades, Late Kalpana, Nora Fatehi, Jaya Sudha in crucial roles. Gopi Sunder has provided tunes to this classy entertainer. Read below for Oopiri Movie Review and Rating. Vikram Aditya (Nagarjuna), an quadriplegic patient who leads a boring life eventhough he is a multi billionaire. Seenu (Karthi) comes out of Jail and tries for a job to settle in his life. Vikram Aditya who is needed to take care of him will recruit Seenu after interviewing many candidates with the help of his Personal Secretary Keerthi (Tamannah). Rest of the story deals with how Seenu satisfy Vikram Aditya to ensure his boring life turns to be the happiest moments. Nagarjuna Akkineni is not doubt a major asset in the film and he has done his job with excellence in performing as a paralyzed boss. Karthi performs with ease and gives good support through out the movie by different shades in his role. Tamannah Bhatia looks gorgeous as the secretary and gives refreshment with her role. Jayasudha is seen in Mom role for Karthi from the middle class family. Prakash Raj gives a decent performance and his scenes with Karthi will have necessary punches. Artist Late Kalpana, Tanikella Bharani and Ali will be seen in limited scenes and justifies their respective roles. The cameos by Shriya Saran, Anushka Shetty, Gabriella Demetriades and Nora Fatehi are surprises. Director Vamsi Paidipally has cleverly made this film look refreshing with Telugu Nativity and succeeds with decent screenplay. The director has taken care of each individual role to showcase in the particular limit with no confusion in the script narration. Music Director Gopi Sunder gives a decent back ground score and the audio album goes on decent with visual wonder. Dialogues by Abburi Ravi are neat. Production Values by PVP are rich. Cinematography PS Vinod is at top notch. This multistarrer Oopiri can be rated in the best films in the coming days and the film has all the commercial elements and emotional content to catch hold of audience pulse. Though the film is an official remake of French film, "The Intouchables", Vamsi took care of executing the scenes to impress Telugu audience according to the nativity. The film is all about care and share by the human beings for their sins or love towards the others which is cleverly narrated by the director. The movie starts on decent pace and gets into connection by elevating each and every role with clear narration. Twists and Turns are indeed decent in the form Nag and Karthi's role. However, the film has necessary pace in maintaining the emotions. Oopiri will be loved by all class audience for Nagarjuna’s emotional acting especially in the last 30 minutes of the film and Actor Karthi has much scope in the film too. Their best performances through out the film are an “Oopiri”.